Evidence of Bishopstoke’s ancient past has been unearthed at a site where 85 new properties are being built by Bovis Homes. As work begins on the new homes on the land off Church Rd, archaeologists have returned to their laboratories to finish piecing together some of their finds following a nine week dig. Some early Roman artefacts are among the items uncovered during meticulous excavation work, managed by Prospect Archaeology Ltd and funded by Bovis Homes. 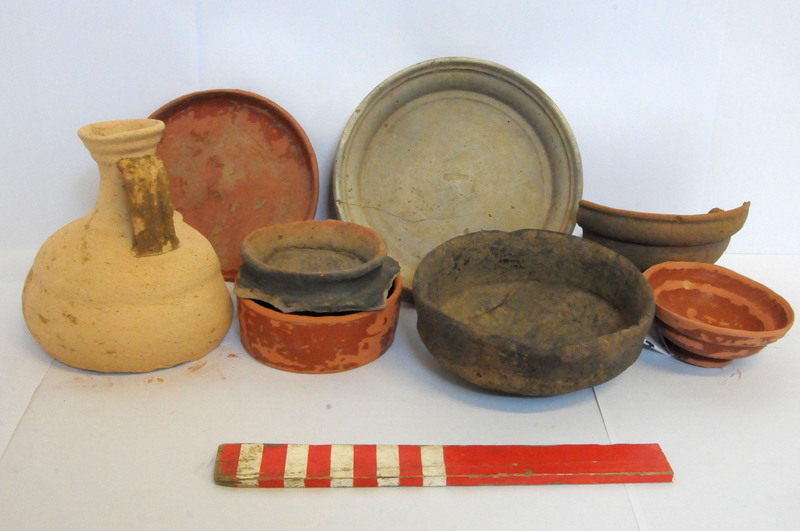 Included in the findings on hillside land west of Church Road, were plates, flagons and bowls, several still containing the remains of wine and food. “Developing the land at Bishopstoke offered this opportunity for our contractors Prospect to explore the site before construction started, and we are delighted that they have unearthed some interesting artefacts that might otherwise have remained undiscovered. The pottery dates to the very early Roman period and some of the high status vessels are Samian wares imported from South Gaul. Other vessels found are handmade in forms typical of the late Iron Age and were probably produced locally. Although no buildings were found, the large concentrations of pottery in the ditches towards the top of the hill suggest there was a once an Iron Age or Roman settlement close by. Neolithic or Bronze Age flint artefacts, dating back to around 2000 BC were also recovered and hint at an even earlier occupation. The excavation came after Bovis Homes were advised by the County Archaeologist that the site should be assessed for potential features of interest. Once the assessment had been carried out, Bovis stripped the topsoil and prepared the site for the dig. Prospect Archaeology now want to display the findings of the dig locally. The first homes on the site are expected to be completed in November ahead of new residents moving in before Christmas.